The performance of the CompM4 series of sights is optimized for use with all generations of night vision devices (NVDs), but is especially suited for 3rd generation night vision technology. 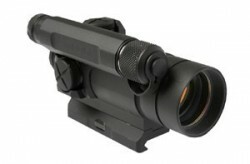 Aimpoint's unique band-pass coating on the front lens reflects select frequencies of red light at near 100% efficiency in order to give the highest possible dot brightness with the smallest amount of energy while transmitting nearly 100% of light in the Infrared and near-infrared part of the spectrum to provide the clearest, brightest image possible when used with a 3rd generation NVD. With 7 NVD-compatible brightness settings and 9 Daylight settings including one extra-bright setting, the CompM4 and CompM4s are ready for use around the clock. Compatible with every generation of Night Vision Devices (NVD). 7 night vision compatible settings and 9 daylight settings. Improved rotary switch will not suffer damage under normal use. Mount base is "keyed" into the body of the sight to absorb recoil. Mount base screws directly into the sight. No seperate sight ring is required. 2 MOA dot for close combat and long distance engagement. Matches perfectly with Aimpoint 3X magnifer. Front lens is threaded for KillFlash and is Submersable to 150 feet. Vertical spacer included, along with inproved adjustment caps. Standardized as the US Army's new M68 CCO.